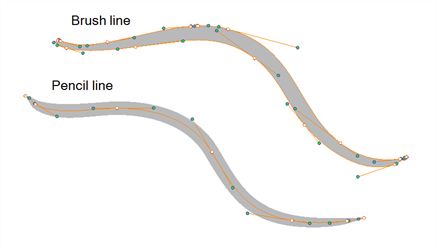 • If you draw with the Brush tool and want to modify the thickness variation, use the Contour Editor tool. • If you draw with the Pencil tool and want to modify the thickness variation, use the Pencil Editor tool. 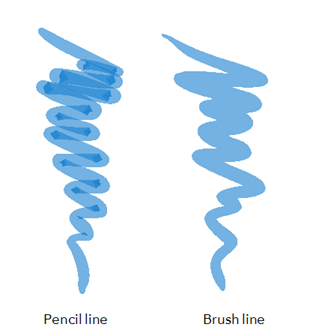 • You can also convert a brush zone into a pencil line with the Brush Stroke to Pencil Line option. If you sketch a drawing using a semitransparent colour to get a paper-like feel, you should use the Brush tool as it produces a more realistic and natural feel. The pencil line is very useful for tracing clean or final drawings. Also, it is recommended to use brush lines when designing cut-out puppet articulations which use patches.